If you are looking for hardwood floors in Airmont NY, Majestic Floors Inc is a fully licensed and insured company that provides flooring installations and many other maintenance services. We offer many refinishing and repair services and use special dustless wood sanding techniques and equipment that allow us to complete jobs in very little time. Unfinished wood flooring. These will be sanded and finished by the installer. This is good for when you need new boards to match existing ones. Factory-finished wood flooring. These are quick and easy to install since they are pre-finished. They will be ready to be walked on as soon as the installation is completed. Solid wood flooring. These are thick cuts that are solid all the way through. They can be refinished and sanded many times. Engineered wood flooring. These are manufactured boards that are layered with different types of wood. They do not expand or contract as much as normal wood during temperature fluctuations. If you would like more information on any of our Airmont NY wood floor services, contact Majestic Floors Inc. The days of cold weather are finally behind us and homeowners can now look forward to sunny days with comfortable climate conditions. Not only does this mean baseball season has begun, but it also signals the beginning of barbecue season. It is time to have friends and family over to your home to celebrate. However, your deck has taken a beating all winter and might need some maintenance. For help getting ready, Majestic Floors Inc offers deck sanding in Bergen County. With the experience and technical skill of our professional deck sanders, you can rest assured that your deck will look like new after we are done with it. When you put your trust in Majestic Floors Inc, you are guaranteed 100% satisfaction with all of our services. Our Bergen County deck sanding services have helped families just like yours to enjoy the benefits on a nicely maintenanced deck area. Your biggest concern at this point in the year should be getting your propane tank refilled. Let us handle your deck’s appearance and return it to fighting form in time for the first picnic of the year. To learn more about deck sanding in Bergen County, call Majestic Floors Inc today at 201-739-1145. If you would like your deck to look just like it was brand new, Majestic Floors Inc provides deck sanding in Rockland County. 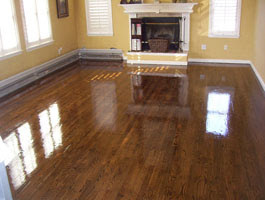 We are a fully licensed and company that offers a wide variety of services for hardwood floors, including deck sanding. Majestic Floors recommends deck sanding in Rockland County over power washing. Power washing puts a lot of pressure on your deck and can split or damage the wood. In addition to that, we use modern sanding equipment and technology that allows us to to complete jobs in a timely manner. We use dustless sanding technology that vacuums airborne dust as its created. This drastically reduces the mess that sanding can make and cuts down on cleaning time. We even have our own dump truck to clean up our mess. No money is spent on rentals. All of these things allow us to pass the savings down to you. If you would like more information on any of these services or deck sanding in Rockland County, call us at 201-739-1145 for a free flooring quote.